When I first got engaged, one of my initial thoughts was "how am I possibly going to be able to choose between all of my friends for bridesmaids.. no seriously.. I'm going to have like ten bridesmaids". Which let's be honest, for our little cozy & rustic chic nuptials, would be a bit overkill. After discussing it together, Kyle and I decided we'd just have our siblings be our groomsmen and bridesmaid. I was so nervous that my closest girlfriends would feel let down by my decision, but they were so incredibly supportive. I stressed to them that I still wanted them to be with me getting ready (mimosas & hair braiding anyone? ), have special recognition (seats by the front during the ceremony). Most importantly, I wanted them to know how much I love and appreciated them. I just want them to make it up to Wisconsin to enjoy this special time with me, no bridesmaid dress necessary. I learned that in the South they call this tradition a "house party"- it can be a great way to include and honor a large group of friends and family without having an enormous wedding party. When I was home over the holidays I gifted my girl friends a few fun & festive bridesmaid gifts and let them know, "I can't say I do without you"! 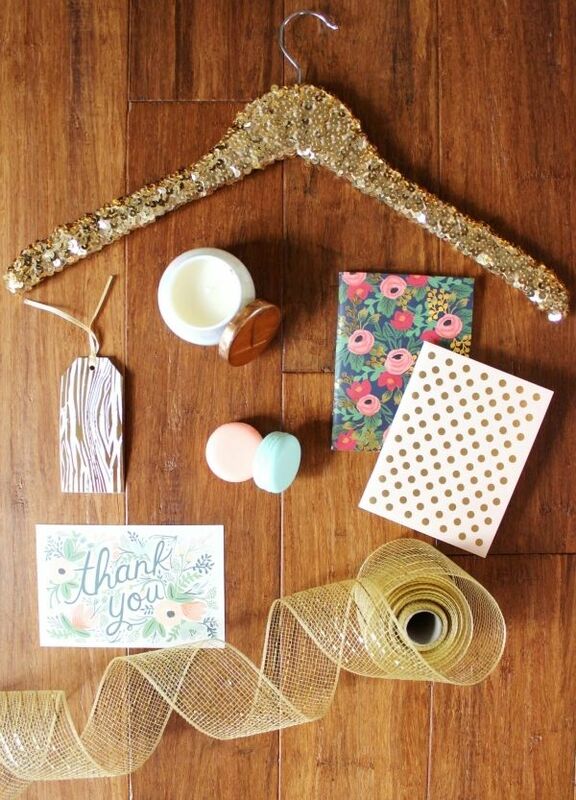 Gold Sequin Hangers: My friend Rachel of Glitter and Bow makes these amazing sequin hangers (in gold & silver). My girls were ooh-ing and ahh-ing over them and I seriously can't wait to take cute photos of our dresses hanging on them the morning of our wedding. Macaron Lip Gloss: My girlfriends know I have an affinity for all things French these cute "macarons" are actually lip glosses (I love these mini macaron cases too). Rifle Paper Co Notebooks: I love having these notebooks around & they're the perfect mini size. This particular floral print was actually the inspiration for our wedding color palette of burgundy, blush & pine. Capri Blue Mini Jar Candles: These candles smell absolutely amazing. The mini size is perfect for gifting and fits the cozy chic vibe of our October wedding. I also wrote notes on these sweet botanical floral cards thanking them for being the best & asking them to be a part of our day! 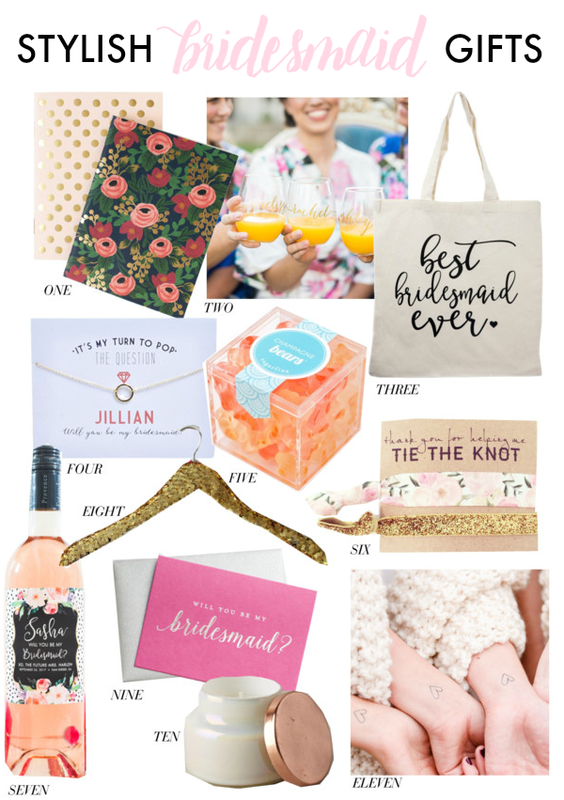 I've also rounded up a few of my favorite ideas for bridesmaid gifts. I'm so incredibly thankful for my friends near and far. After five years of living in Wisconsin, I'm just really excited for everyone to make a trip to the Midwest and enjoy the place I've come to love so much & be with me while I marry my dream guy. I'd love to hear any of your fun ideas for a relaxing & fun wedding morning. I'm thinking coffee & mimosas, a fun playlist & pampering with my favorite ladies! Isn't it wonderful to have so many loving relationships! Enjoy all the festivities leading up to your big day! I love this post! 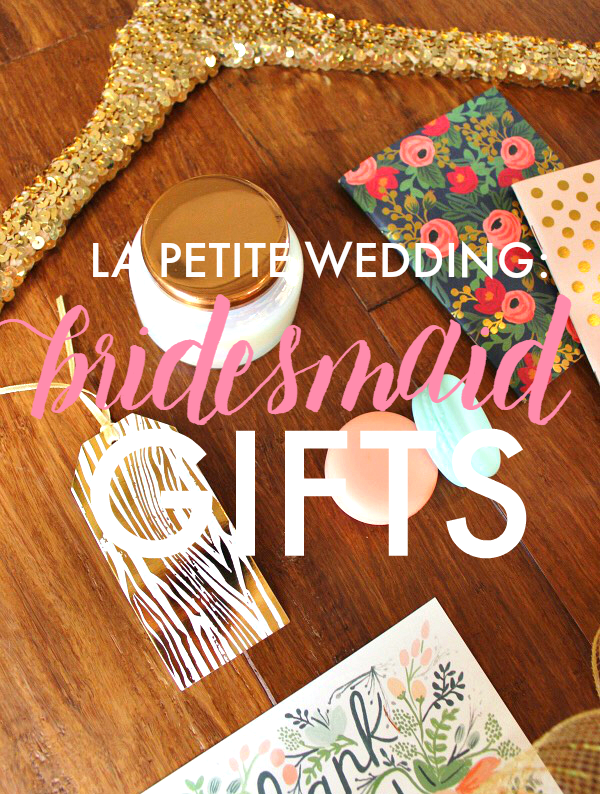 Such thoughtful and adorable gift ideas (those champagne gummy bears are AWESOME). Your friends are some lucky ladies! LOVE these ideas! Definitely keeping these in mind for my bridal party! Thanks! The manager suggested doing a signature cocktail during cocktail hour, which turned to be a huge hit. There is a full bar close to the entrance area, so we were covered there too. Dessert at wedding venues NYC was a presentation of cookies (all looked homemade) and my favorite was the white chocolate, macadamia nut.